2) Check out a “Cliff's Notes” version below. Step 1: Purchase your container from a reputable source. 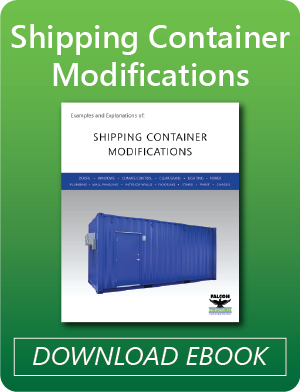 Thousands of shipping containers are available for purchase in the market today. However, containers vary by age, condition, and how they are modified. At Falcon, we use one-trip containers for most applications and offer a 1-year warranty on parts and workmanship. Step 2: Avoid putting too much weight on the roof. The shipping container’s corner posts provide the strength and support, not the actual roof itself. So, if you walk across or store heavy items on the roof, it will flex. If rooftop storage is important to you, your supplier can reinforce the roof, even for heavy loads, for an additional cost. Step 3: Remove debris, standing water, ice, and snow from the roof. Water, ice, and snow can put a strain on the roof and cause dents and scratches. Plus, standing water can lead to rust, thinning metal in the roof, and moisture intrusion. After a weather event, clean off the roof as soon as possible. Step 4: Follow manufacturer recommendations for climate control system maintenance. 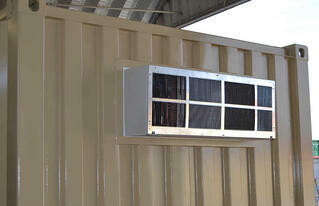 Falcon’s heating and air conditioning systems are similar to hotel or motel HVAC systems. Replace air filters per manufacturer instructions and call a professional HVAC contractor for regular maintenance, service, and repair. Step 5: Inspect the roof for rust, dents, scratches, moisture, and debris. Scratches, dents, and peeling paint increase the propensity for rust – so be sure to inspect the roof and remove debris annually. Touch up any paint to prevent any thinning of the metal. Our blog post on paint maintenance goes into more detail. Step 6: Clean off visible dirt and surface rust. Use a commercial wetting agent, mild bleach, or anti-mildew solution along with a water hose and broom to release rust and dirt. Call a professional to repair larger dents, scratches, rust spots, and holes and to repaint the container as needed. Step 7: Inspect and replace caulk and weather stripping around windows and doors. When caulk or weather stripping cracks or peels off, air and moisture can enter the space. Moisture intrusion can encourage mildew growth and your climate control system will need to work harder when windows and doors aren’t sealed tight. Step 8: Lubricate cargo door hinges as needed. Shipping container cargo door hinges may seize up after a few years when not in use. While some door hinges are equipped with grease fittings, most hinges free up if you apply a little penetrating lubricant. Contact Falcon for tips on freeing stubborn cargo door hinges. Step 9: Check plumbing ports, drain lines, and electrical connections. If your Connex container has plumbing – for a sink, toilet, shower, etc. – be sure to inspect drain lines and the plumbing port regularly. Also, check electrical connections regularly for wear or damage, and tighten any loose connections. Contact a licensed electrician if problems are seen. Step 10: Monitor the container for settling and re-level. 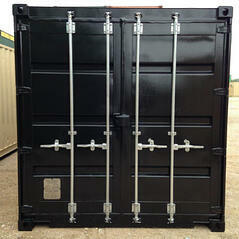 If you install your shipping container on soft surfaces the container will settle over time. Prior to purchase, ask your shipping container supplier to recommend proper foundation and support mechanisms to help deter settling. Want more details on these steps? Download the full guide now! If you have questions about shipping container maintenance or would like to discuss a new application, we’re here to help. To speak with one of our friendly Falcon representatives, give us a call at 877-704-0177 today.